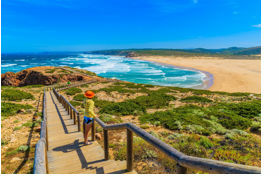 Easter is traditionally a busy time in the Algarve with visitors from across Europe coming to the most south-westerly point of Portugal to enjoy their spring holiday. This Easter in the Algarve looks to be one of the busiest in recent years. The World Travel & Tourism Council estimates that the tourism growth in Portugal is twice as high as last year and that this growth is expected to grow more than 5%. The Portuguese government has approved no-deal legislation to protect the rights of UK nationals in the case of a no-deal Brexit arrangement. Shot in Portugal, the film Portugal – Der Wanderfilm (Portugal – The Walking Movie) documents a German couple’s walk from the southern region of Portugal, Algarve, to the north of the country. Whilst the Brexit situation remains unsolved, the Portuguese tourism board are reaching out to British tourists with a recently launched “Brelcome” campaign, aimed at easing worries about travelling to the country following all Brexit decisions.